This trio teams two top-notch improvisers from the vibrant Chicago music community with one luminary of European improvised music. 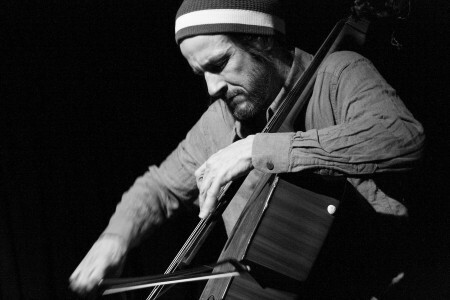 A major player in his native Germany since the 1970s and frequently appearing on the roster of important labels like FMP and Moers Music, bassist Torsten Müller worked regularly in duo with trombonist/cellist Günter Christmann and in countless other all-star ensembles before relocating to Vancouver in 2001. His innovative extended techniques draw an astonishing array of unexpected sounds from the acoustic bass. Last seen in Seattle at the 2003 Seattle Improvised Music Festival, it will be a treat to welcome him again. Joining him are Michael Zerang and Fred Lonberg-Holm, both major figures in the Chicago scene who share a mutual chemistry forged through frequent collaboration as a duo. Lonberg-Holm is perhaps the hardest working cellist in Chicago, whether it’s for contemporary chamber music, wild rockin’ with God is My Co-Pilot, alt country with Freakwater, art-pop with Jim O’Rourke, or free jazz with legendary screamers like Peter Brötzmann or vocalist Jaap Blonk. Similarly, Zerang bangs on things with everyone of note who lives in or passes through the Windy City, as well as acting as a tireless organizer of concerts.